Don’t let HR create No Man’s Land! The people of Sepia World will feel cheated of these fantastic and seductive promises! No Man’s Land sounds like the kind of knock-off name they’d use in the comic, though. Life imitates art imitates life? Or, no, art imitates art imitates life? Or is it, art that has art in it that has life in it was copied by an artist in the art, and from that, in life, a reference was made to other art, which,accidentally and unbeknownst to some, was referred to jokingly as if it were an imitation of that other art despite it actually already being an imitation of life? That’s when the wax apple prop for the still life spontaneously combusts. There’s no such thing as a beneficial monopoly. Competition is what drives people to excel & achieve progress. In a monopoly, invention & innovation is stifled because no one has the incentive for progress if there’s no expectation of reward. HR is trying to make everything into a monopoly for himself. Everything will stagnate & rot away if there’s no competition to resist it. Aaaaah… this actually DOES explain a lot! For once, an omniscient “oracle” that doesn’t beat around the bush with the really important bits! Haha, yeah, I was just thinking that. And with visuals too! Agreed although his earlier attempt at being cryptic didn’t go over so well. At lest he knew when to quit. You could say he had a general idea of the outcome. I really expected to go the entire duration of the comic without the relationship between Arkherra and Kingdoms of Arkherra ever being explained, except maybe in like, the last five pages of the final chapter. HR is a Prince of the Courts of Chaos? Does that mean we need a Prince of Amber to save the world? I haven’t read those books in years, but I’m really really happy to see them referenced in the wild! Seems like HR is brand then. I guess Frigg is our random. That’s an insult to Random. He’s much more intelligent and cool-headed. And more importantly, I have grave doubts about Frigg’s ability to play drums with five sticks. No, I think HR is the Lord of Order. Too much Order means that nothing changes & nothing CAN change. Total Order means structure & stability, yes, but it also means stagnation. Too much Chaos means that everything falls apart. In an environment where the only Constant Factor IS Change, nothing can exist because there’s no way anything can form. Everything everywhere that humanity has ever observed, it all exists in a zone of overlap as Order & Chaos intermingle with each other, but there can be no expression of either extreme within this overlapping zone. Okay, he’s definitely Steve Jobs, not Bill Gates. HR’s fingers in that last panel are weirding me out. Odd lengths. A little facehuggerish. That, or he’s blowing on the soup. Perhaps he’s fascinatedly blowing the soup? Ah. HR is a man after my own heart. Willing to create and destroy worlds to get his hands on that elusive godhood. Now if only those meddling kids would keep away, so that i can get away with my plans. Dang kids and their fabric of reality. Quick! Give them all Scooby Snax™ to motivate them to action! No, wait! They need Internet Cookies™! To make thngs worse the world we now reside on is stuck in Early Access. This is actually true of every game universe. So, somewhere there is an Arkerra without HR’s manipulations? I was wondering the same, but it seems implied that it was destroyed when the copy was made—otherwise why would it be said he’d destroy every universe? That’s not implied anywhere. The implication is that HR, for whatever reason, can’t make his dream world without destroying all existing worlds, and he created this Arkerra to gain the power to do that. 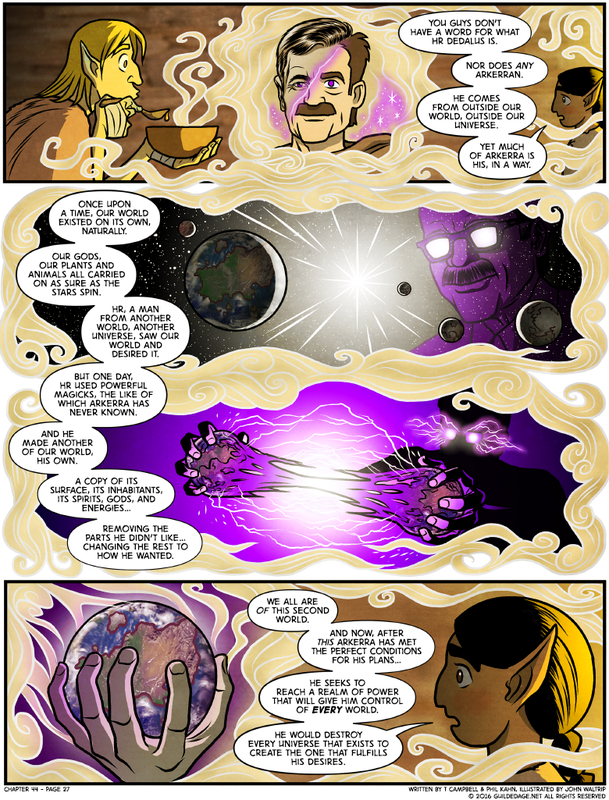 No universes have been destroyed in the making of this comic (yet). Sounds like an in-universe way of explaining a server wipe. Arkerra was someone else’s beautiful idyllic IP and HR perverted it for his own ends. Fortunately the insane update rate of this comic will keep all stories progressing pretty fast. Hmmm, would Frigg be from A#1? 0___0 ?? Umm…everything ok there Chris? Did you have some kind of mild seizure?? Looks more like a description of Best’s face as he’s blowing off his soup, just to see a man’s face form in the steam. Wow! HR just became a much more serious threat. If I’m understanding this right, he may very soon have the will and ability to destroy Sepia world. Honestly, I hope he does. Well now. I honestly thought that We’ll see the danger of the Dwarf leader guy (I forgot his name) will be to the hoard side. Woah, that alt text joke actually has a serious quandary wedged in it: would YOU destroy all existing realities to make your own ‘ideal’ (by your own standards, morals etc.) universe that conforms to all your desires?? Just ask Rimmer about “Better Than Life”. Complete control can become boring after a time. And as a God, all you have is time. Megalomaniac? I think Arkerrans know that word. No, so far they don’t. Such a word has yet to emerge in their language. But soon, that concept will be encapsulated by the household name of Iwatani. Is it just me, or did the redundant Department of Redundancy Department just strike? I mean, look at that text: we’re told that HR is “a man from outside our world, outside our universe”; then we’re told that he’s “a man from another world, another universe”. It also feels a bit clumsy, transitioning from “he saw our world and desired it” to “but one day, he used powerful magics…” but implies contrast; what we see here is pretty much the opposite of that: a natural continuation of the same thought. Cut out the “but” and one instance of the “man from … world, … universe”, and it reads much more smoothly. Now I’m looking forward to Friday’s revelations. We all know that one of them will be that the former Peacekeepers come from the same world that HR comes from; but after today, I’m wondering it will also be revealed that their anti-Gastonia counterparts come from the original Arkerra. There is value in repetition for such an important reveal. It improves clarity and reduces the chance of people missing it. It’s easy to gloss over information that’s only mentioned once in a single panel of the comic. When it’s reiterated several times, people pay more attention. When you want to make sure the reader understands something, it helps to say it several times, sometimes even right in a row. It gives your point more emphasis. So he is a filthy item duper. Like the elf Maguna from WTFcomics. Even worse, he’s also mastered Ctrl + Z & he’s closing in on mastering the text editor. So every time I make a choice, I destroy every universe where I didn’t make that choice?